Their expectations for growth in revenue, earnings, hiring and wages declined (only capital expenditure rose); all metrics sit below their two-year averages. Companies are using a variety of programs to promote diversity and inclusion; flexible work arrangements are the most common. 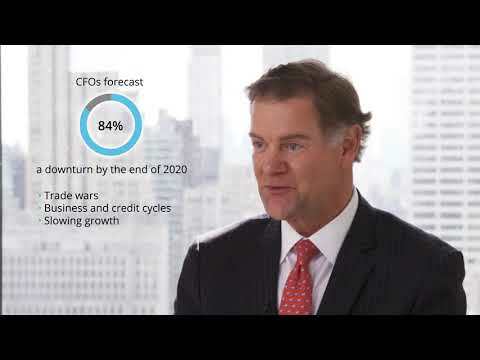 Why it matters to CFOs? Each quarter, CFO Signals tracks the thinking and actions of CFOs representing many of North America's largest and most influential companies. Since 2010, the report has provided key insights into the business environment, company priorities and expectations, finance priorities and CFOs' personal priorities. CFOs' perceptions of North America declined, with 80 percent rating current conditions as good (down from 88 percent) and 28 percent expecting better conditions in a year (same as last quarter). Perceptions of Europe declined, with 16 percent noting current conditions as good and only 8 percent expecting better conditions in a year; Their views of China's economy slid, with 20 percent indicating current conditions are good and 16 percent expecting better conditions in a year. The majority of CFOs cited a formal D&I strategy; about half said the strategy is known throughout their company and embedded in their talent brand. Eight of the nine D&I tactics, such as (including diversity metrics in internal reporting, providing training around unconscious bias, assigning D&I responsibility to a senior leader, and issuing companywide principles for D&I) presented were selected by at least 40 percent of CFOs. Implementation of flexible work arrangements was the most-selected tactic. CFOs' expectations for year-over-year revenue growth fell from 5.5 percent to 4.8 percent; their expectations for earnings growth slid from 7.3 percent to 7.1 percent; capital spending rose from 5.0 percent to 5.9 percent; and plans for hiring fell from 3.2 percent to 2.1 percent (all sit below their two-year averages). Their expectations for dividend growth declined from 4.5 percent to 3.9 percent, the lowest level since the fourth quarter of 2017. The net optimism index for CFOs sentiment on their own companies rebounded from last quarter's dismal +3 to +16 — better, but is still the third-lowest level in three years. Thirty-two percent of CFOs expressed rising optimism (26 percent last quarter), and 16 percent declining optimism (23 percent last quarter). CFOs voiced even stronger concerns about trade policy (especially U.S.-China policy) and continuing concerns about economic risks/slowdown and U.S. political turmoil. For internal risks, CFOs again expressed strong concerns related to talent and strategy execution. Other concerns such as achieving growth and managing costs continued to increase, as did worries related to adaptation, change, prioritization and overload. To see additional results from Deloitte's first-quarter 2019 CFO Signals survey, download a copy at: http://www.deloitte.com/us/cfosignals2019Q1. Each quarter, CFO Signals tracks the thinking and actions of CFOs representing many of North America's largest and most influential organizations. This report summarizes CFOs' opinions in four areas: business environment; company priorities and expectations; finance priorities; and CFOs' personal priorities. The Deloitte CFO Signals survey for the first quarter of 2019 was conducted during the two-week period opening Feb. 11, 2019 and ending Feb. 22, 2019. A total of 158 CFOs responded. Sixty-nine percent of respondents were from public companies, and 84 percent were from companies with more than $1 billion in annual revenue.